Facebook is just like Marmite: Either you love it or you hate it. But one thing is clear: If you want to be successful, no matter what domain you’re active in, you’ve got to at least be present on the platform. And that’s the reason why Facebook is on everyone’s minds and in conversations and articles. Most people see it as being a fun way to keep in touch with friends and members of the family, some people see it as a key factor in their business and invest money in it and some people find it a time-wasting network and encourage others to quit it. If you’re in the second category, you know that when it comes to Facebook, data is king. Data is what helps us prove the efficiency of our campaigns and optimize our services and products, and it made Facebook the leader of the digital world. We at Bannersnack always believed that the best projects are the ones that involve at least one aspect we love. In this case, it was basketball. 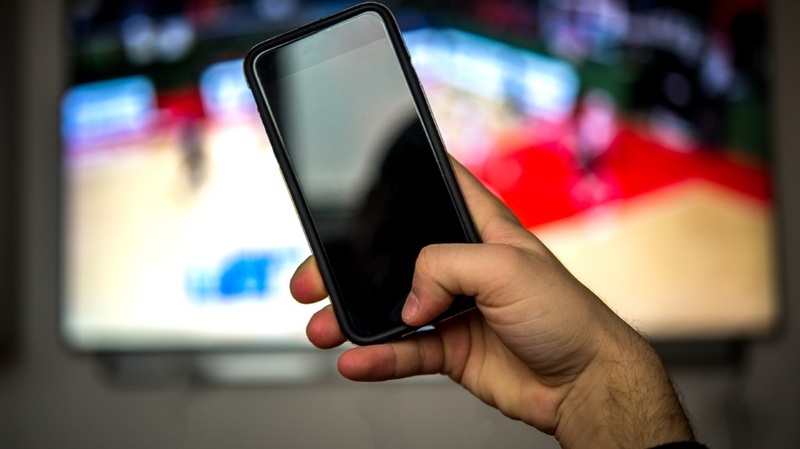 For this article, we decided to analyze the best Facebook posts of all National Basketball Association teams for 2017 and bring out the data that might be useful to you for your future campaigns on social media. So, sit back, and pay attention. In order to easily find all of the data we needed, we used BuzzSumo’s Facebook Analyzer feature. It’s pretty easy: Enter the page you want in the search box and the results begin to run. The three posts with the most interactions are from the Cleveland Cavaliers, Golden State Warriors and Houston Rockets. 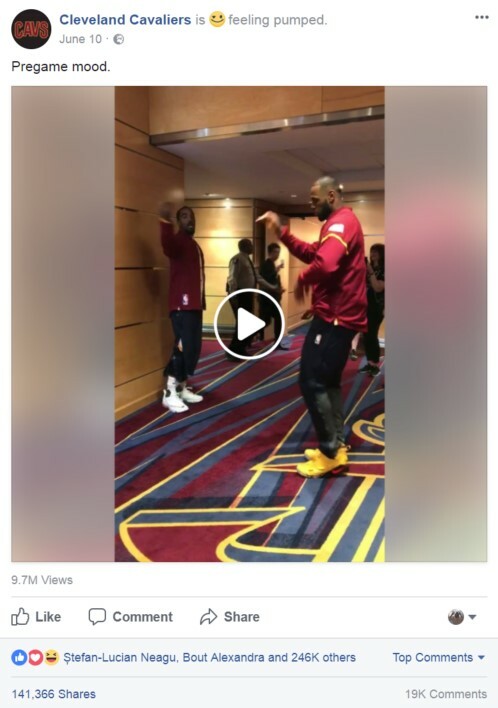 The Cavaliers’ most popular post is a video recorded before the NBA Finals against the Warriors in which shooting guard J.R Smith and superstar forward LeBron James dance to put themselves in the mood for the game. 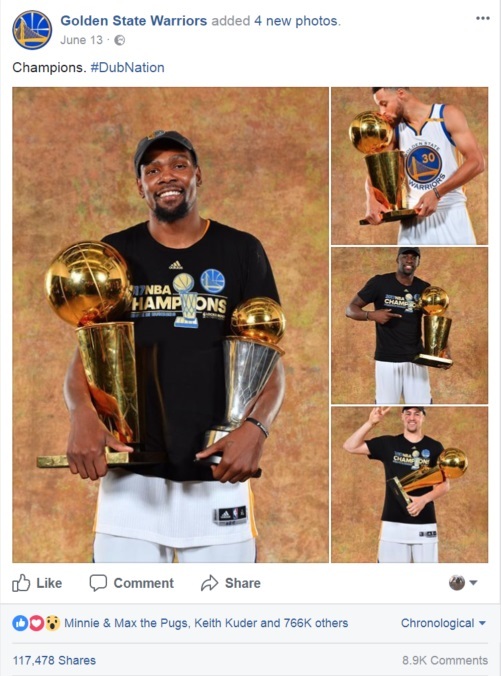 The Warriors’ best post, as expected, is one from after the team won the championship. The post features four players holding the Larry O’Brien Trophy. 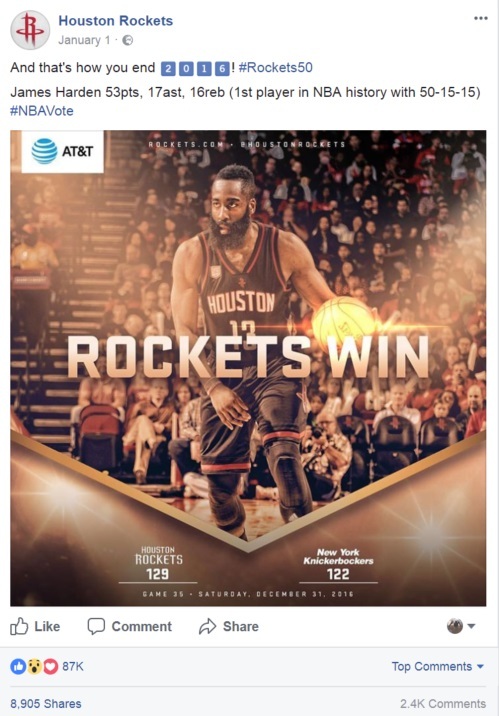 The Rockets posted a photo of James Harden after beating the New York Knicks Jan. 1. After the game, Harden became the first player in NBA history to finish with a 50-15-15 stat line (50 points, 15 rebounds, 15 assists). Through this post, The Rockets reminded fans to vote for Harden as Most Valuable Player for the season. What can we learn from this? Show your fans and followers another side of your team. Just like other businesses show behind-the-scenes content from their production and meetings or after hours, you can do that, too, by showing people how your team has fun. Let people get a glimpse of your team’s personality off-court. If there is something to be celebrated, let your fans know and be happy with you. Support your players’ individual successes. This is a great proof of your team’s solidarity. After analyzing all 30 NBA teams’ Facebook pages, we realized that there was a certain kind of post that received more attention than any other. Facebook Analyzer gives you exactly the information you need when looking for a summary of a page. For example, you can see the most popular post type on the page, along with the most popular post length, day and time. 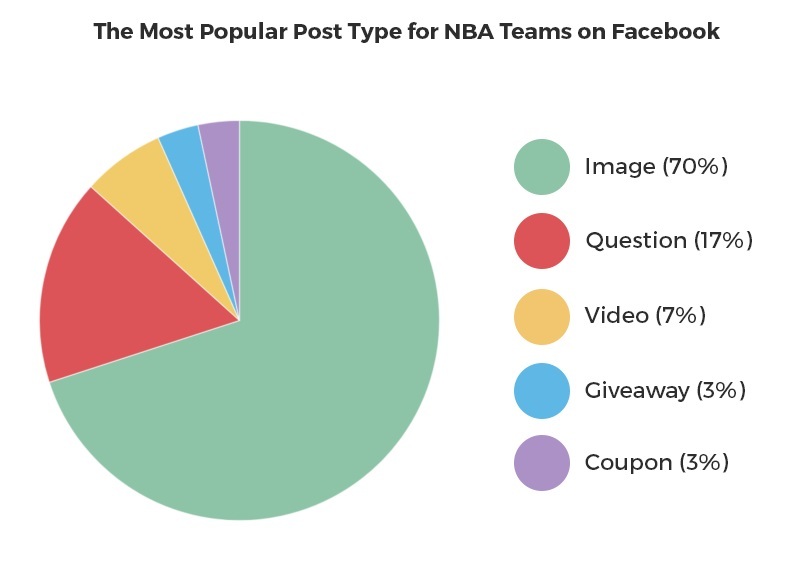 Out of the 30 NBA team pages, images were the most popular post type of 21, followed by questions (five), with only two pages having video as their most popular post types and just one each for giveaway and coupon. When it comes to length, we found that most teams were under 50 characters, as many of them use Facebook to share scores. Also, they’re using hashtags like #NBAVote or #DubNation (the Warriors’ much-loved hashtag) to help followers rapidly identify what the post is about.